Whether you're looking for speakers for your stereo music system or seeking out new front speakers for your home theater, you can count on the Polk TSi400 for clean, engaging sound. Its silk tweeter delivers sparkling highs, while three polycarbonate woofers churn out accurate mids and lows. The well-braced cabinet fights resonance so the details in your music and movies shine through. Dual five-way binding posts let you bi-amp or bi-wire the TSi400 for even better performance - a rare feature for a speaker in this price range. A woodgrain finish gives the TSi400 a refined looked, capped by an elegant piano black top plate. At the base of the speaker you'll find sturdy stabilizer feet to keep it anchored to your floor, regardless of whether it's carpeted or non-carpeted. And since the speaker's footprint takes up less than one square foot, you can enjoy high-impact tower speaker sound without sacrificing a lot of space. Unlike the electronics, your speakers won't go out of date, so bring out the most in your entertainment experience with Polk TSi Series. A great match to the TSi Series, the Polk Audio CS10 center channel speaker--the most important speaker in surround sound--is smaller than its sibling CS20, but still sounds just as good. And it has an angled top allowing you to invert the speaker and place it below your TV--directing sound towards the listening area. The TSi Series and the CS10 were designed to be highly efficient, so they can be driven easily by unpretentious receivers, and they're voice-matched for lifelike surround sound environments. 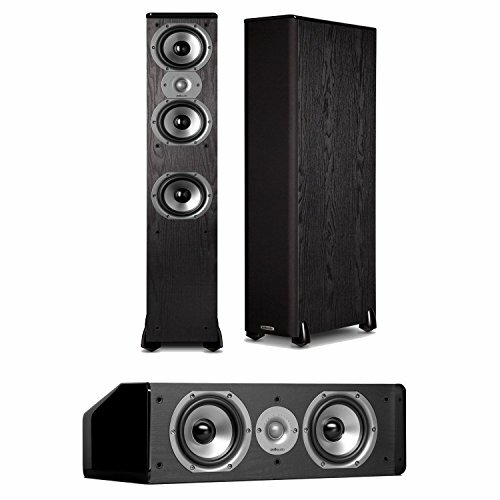 This speaker in black measures 6-1/2 by 20 x 9-3/4 inches (HxWxD).